OK, this is being written at the very end of a very tiring first day. Lots of walking as usual, cold dry weather, jet lag, and low nutrition and hydration. Blackmagic Cinema camera. Yes Blackmagic has thrown their hat in the camera ring. It's 2.5k. Shoots as CinemaDNG (an 'open' RAW format), or ProRes or DNxHD. Records on SSDs. Has a touch screen. And allows easy naming of clips with auto incrementing of takes/shots. Just like Deva does for sound. So you don't have to deal with names like 377_0982_03, or A112C001RTYJ3 etc. Blackmagic announcement of a improved Resolve interface. Ultrastudio express, small Thunderbolt video I/O. Terranex converters at ridiculous prices but with same features and performance and more. Reduced mini-converter prices. Aja has a 4k recorder (Ki Pro Quad), that receives 4k RAW from Canon's forthcoming 4k camera the C500. 4k will stream as RAW over HD-SDI. And debarring will also be done by the the KiPro Quad. Aja also announced a tiny Thunderbolt output device, and a rack mount KiPro. KiPros will now record as DNxHD via a free software update. Arri showed a software update for the Alexa which is FREE and which allows you to shoot full 2k on the Alexa as ProRes. This is a slight resolution boost from HD. Canon showed the C500 camera and the 1D-C 4k cinema camera. Its much larger than the 5D MkII and costs many times more. GoPro had a huge stall that threatened to edge out Panasonic. Sony moved to the back of the central hall from their position at the entrance. Blackmagic was the largest stall at the entrance of South Hall. Quantel, Filmlight, Autodesk stalls were considerably shrunk. Prime Focus are showing the same old CLEAR stuff which wins awards but appears to be a solution looking for a problem. 3D is not everywhere but still seems to be a fad that refuses to go away. Disk storage systems big and small of all shapes and sizes were everywhere. Thunderbolt devices were in the scores if not hundreds too. Dailies and on-set data management seems to be an upcoming flavor. Many systems, some costing many tens thousands of dollars were presented. Colorfront, Scratch Lab, many others. Links to other coverages on NAB 2012. Expect something dramatic about Smoke from Autodesk. It's not clear if its Smoke on Mac or Linux, or maybe both. I won't make it for this as I'll be on the way to Vegas when it happens. 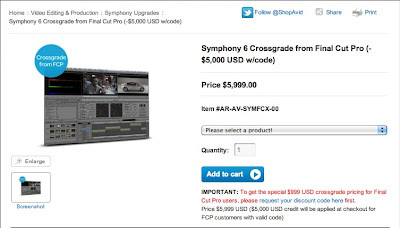 Avid Symphony affordable... or not? Avid has just announced Symphony 6 for US$ 999 (meaning Rs 75,000 to 80,000 in India). This is for an upgrade from Media Composer. A crossgrade from FCP ridiculously costs US$ 5,999 (Rs 4.5-4.8 lakhs in India). Symphony is like an Avid Media Composer with Smoke capabilities but a Media Composer timeline. You still need a powerful MacPro or HP Z800 Windows workstation. And video I/O like select Aja or Blackmagic cards, or a Nitris box. And Canon just introduced a DSLR capable of 4k digital movies. It's motion-JPEG 4:2:2 8-bit, but the video is ready to use, no need for conversions. The camera will also output video uncompressed as a video signal at 4k and HD. But 8-bit. Pricing is stated as US$ 15,000 and available 'within 2012'. It's been a bit quiet on my blog lately. I've been busy with an initiative to help digital movie makers. 'Movie-makers' because film-makers use film to make movies, 'movie-makers' make movies, with or without film. Anyway, this initiative is still under development, with name, trademark, and other procedural issues being sorted out. Once it's all done, I'll report here. Meanwhile, I'm at NAB 2012. For those that don't know, NAB is the National Association of Broadcasters. Every year, they organize a large exhibition and conference at Las Vegas in the US. The exhibition begins Monday 16 Apr this year. So, leading up to the exhibition there have been several announcements. Some of which will impact movie production and post-production. I'm concentrating on post-production as that's more of my livelihood for now. A Thunderbolt equipped MacPro is still awaited, but the number of Thunderbolt equipped MacBook Pros, iMacs, and Mac minis are growing. Thunderbolt devices have been pretty thin so far. This NAB, expect a whole new set of Thunderbolt peripherals. Thunderbolt - PCIe, Thunderbolt - SATA, Thunderbolt - Fibre, Thunderbolt - GigE, Thunderbolt - SAS, and many others not yet unveiled, might mean that maybe we won't need that Thunderbolt MacPro so badly after all. Avid Media Composer 6 has been out for a while, and Avid, most certainly, has more tricks to show. Adobe has just unveiled Premiere Pro 6 which at least one site has proclaimed is the 'FCP 8' that never happened. And, there may be a new entrant in this edit software market. Maybe, but not certain. FCP X, an editing software that has been slammed by some hailed by others, and possibly doesn't enjoy the numbers that FCP 7 did. This NAB, may be the turning point. We may see many stalls sporting FCP X. There are indications that FCP X is gaining traction, although from a whole new market. I for one am making it a priority to examine this piece of software more closely, and even use it more that I currently do. An announcement from Apple is unlikely, but no one can really predict Apple. Filmlight showed the Baselight plug-in last year. It's shipping this year, for FCP 7, even if its been almost a year since FCP 7 has been discontinued. For a large installed base of FCP 7 users, particularly those who need to inter operate with the full Baselight, here is a innovative colour correction during editing workflow. GenArts, Foundry, and a host of others make plug-ins for FCP (7 and X), Avid, Premiere Pro, and other NLEs. These seem to do pretty well and at NAB 2012 we will see more and better stuff from them. I have a ffeling though, that plug-ins need to improve dramatically, in capability and speed, and fall in price if anyone has to make windfall from making them. Blackmagic always has something new - cards, external devices, software, something. This year too, expect something. Maybe something Earth-shattering like the $ 1000 Resolve some time ago. Maybe a new control surface, or even a monitor. Aja too, probably, has something big planned for NAB. Their current Thunderbolt video I/O offerings are already more featured that anyone else's. But something more that video I/O may be shown. Red, the digital camera company that created a huge impact to the digital movie-making market with the Red camera, has a stall at NAB this year. So expect either a new camera announcement, modifications or upgrades to existing ones, or something dramatic. This is also probably the first year this innovative company has some real competition. Many companies will show digital movie data recording, copying, transcoding, and management tools. In the form of software, hardware, devices, or all of the above. A couple of years ago, after Avatar, 3D was projected as the next big thing. It hasn't quite worked out that way, and 2D is still around in a big way. This year too, 3D will be about as luke warm as it was and may even go on the decline. The passing of film - 'tapeless' - has been spoken about in every NAB for the past decade or so. This is probably the first NAB where film's end is truly near. And if, between this NAB and the next, film manufacturing companies go under, then NAB 2012 might be the last year we see film scanners and recorders. Autodesk, DFT (Thomson), Quantel, FilmLight, Arri, Digital Vision aka Nucoda, Cintel, Grass Valley, and others - these have been the big boys in post-production at NAB. Large stalls, hundreds of people manning them, announcements, parties, multi-million dollar gear on show and sale - have been their characteristics. The decentralization of movie production, changing nature of broadcast, Internet based entertainment, approaching demise of film, and other factors have threatened their existence just like the mainframe computer manufacturers were edged out by the desktop PC revolution. And so their stalls and presence shrinks with every passing year. But you can't write them off yet. This NAB, at least one of the big boys will have one more big moment. And maybe one or more of them won't be around after this year. Sad, but likely true.